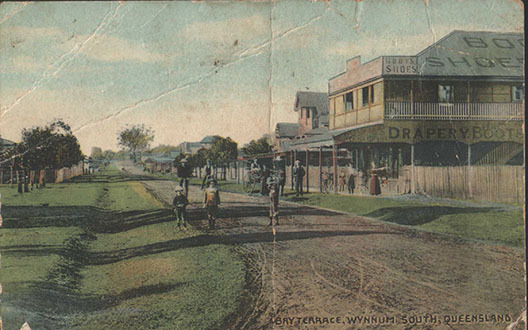 To read a short history of early Wynnum and Manly, click here. The Premier of Queensland from 1906-1910, William Kidston, owned extensive real estate here at Mt Margaret. In 1918, Archbishop Duhig purchased 60 acres for the Catholic Church. Nazareth House was built on this land as an aged home and orphanage. It took its name from the Poor Sisters of Nazareth which was founded in London in 1851. Nazareth House was designed by architects, Hennessy, Hennessy, Kessing & Co. The foundation stone was laid by His Grace Archbishop Duhig in 1924 and opened by Sir Matthew Nathan in 1925. In 1938, George H Turner & Sons considered it an honour to have the contract to build the extensions of the chapel, convent and laundry block at a cost of £38,000. The chapel is a place of beauty and serenity and houses a grandiose marble altar. The orphanage ceased to operate in 1982 but Nazareth House continues to operate as an aged care facility. Nazareth House is situated at 272 Wynnum North Road, Wynnum North. Beitz, M, A quick tour around Wynnum, Manly and Lota, p. 1. Retired grazier from Beaudesert, William Duckett White, built this home of brick and plastered white in 1863. It is the oldest standing house in the district. It was named Lota after the home of William’s wife, Jane, had lived in on the shores of Cork Harbour. The house is roofed with grey slate, French windows and doors with green shutters running on iron rails opening onto wide stone verandahs. Internal solid doors of cedar have unique top openings for ventilation. Extensions were made by Duckett White in 1913. The home remained in the White family for 100 years. In 1963, a generous benefactor, Sir Edwin Marsden Tooth, enabled the Anglican Church to acquire the property to establish a Home for the Aged. 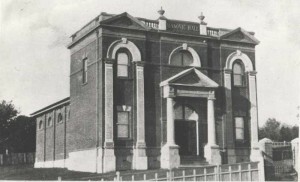 The property was State Heritage Listed on 21 October 1992. Lota House is situated at 162 Oceana Street, Manly. Beitz, M, A quick tour around Wynnum, Manly and Lota, p. 9. The Lodge was formed in 1894 with 24 members who met in the Shire Hall. 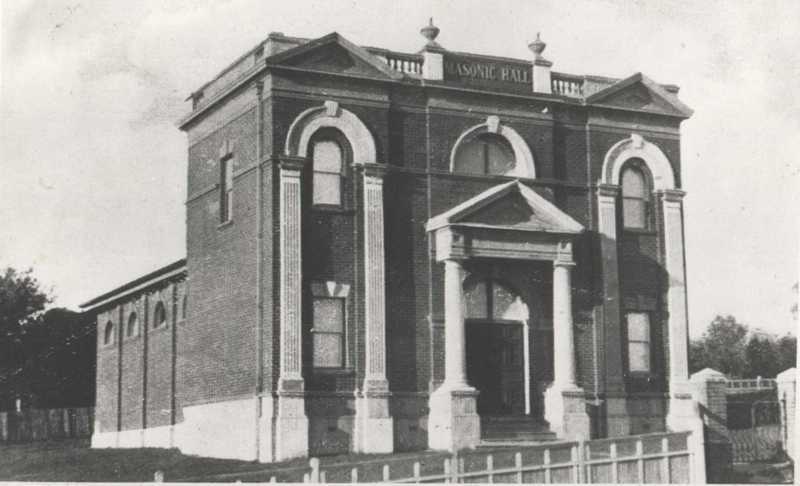 The Wynnum Masonic Lodge is a Regency style temple designed by a non Wynnum lodge member, V Wor. Bro. Wilkes, and was built in 1920. It is situated on Tingal Road, Wynnum. View YouTube clip produced and presented by Trish Breen to see inside the Lodge and hear about its history. The original Margaret Marr Home was built in 1924 on 17 acres and managed by the Methodist Church. 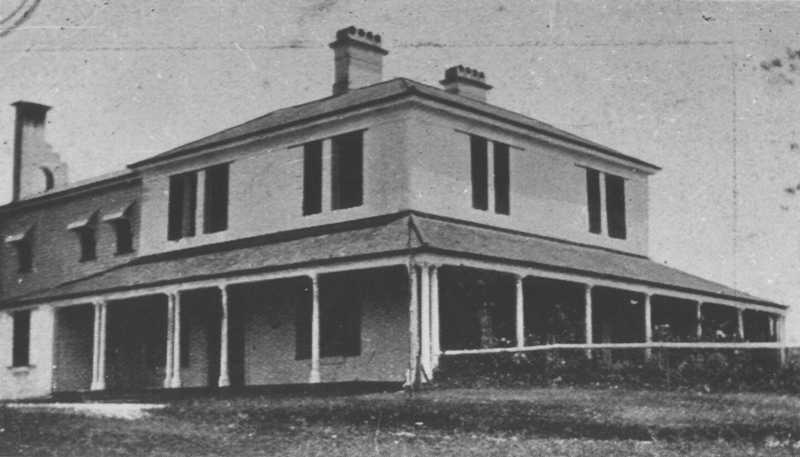 John Marr was the proprietor of Marr’s Boarding House in Brisbane, and the Home was named after John’s wife as was the area Mt Margaret on which Nazareth House was built. Many homeless boys were taken in and cared for at the Margaret Marr Home. Extra wings were added from time to time. Over 900 Queensland boys received a good start in life from their time spent at Margaret Marr. One such person was Brisbane solicitor, Fred Lippiatt, who at the dedication service in 1995 had some interesting tales to tell of his stay at Margaret Marr Home. During World War II, the Royal Australian Air Force used the home as staff headquarters when operating Radar Station No 23 at the top of Lytton Hill. The young boys who were resident there at the time were billetted out west during the occupancy. 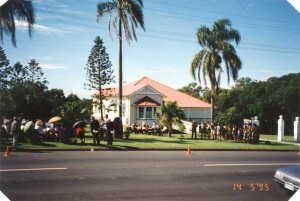 On 14 May 1995, the Wynnum Manly Historical Society placed a memorial stone on the site for the Margaret Marr Home and Radar Station No 23. The 14 May is of historical significance. On this day in 1943, the hospital ship the Centaur was sunk off Moreton Island. This quote is from a poem written by Radar Operator Jean Renew who was on duty that night. The original Margaret Marr Home was demolished due to white ants. The home of the Rev Rees Thomas was relocated here, turned and still stands in the redeveloped area at North Point. John Manifold – Australian poet who lived at Wynnum North. Ken Lord – Actor and gossip columnist. John Knox – Retired newsreader from Radio Station 4KQ. Spencer Howson – ABC announcer who went to Manly School. Herb Hamlet – Author of “Bluey’s War” lived in Wynnum for 40 years and it is said that some of the characters in his book are based on Wynnum people. Samantha Riley – Australian olympic swimmer.